Hello, my name is Lucien Lowe, Australasian Registered Piano Tuner/Technician, Licensed Electronics Technician. For the last 30 years our business has been the repair, maintenance and tuning of pianos, repair and maintenance of electronic organs, keyboards and digital pianos and the supply of only quality instruments at affordable prices. It is important to have only experienced and qualified technicians service and tune your valued instrument. Good instruments can be severely devalued and have performance compromised from poor servicing. 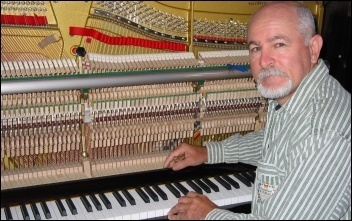 Australian Piano Tuners and Technicians Guild members are a good start to selecting a good reliable piano tuner. These people have had the training and experience necessary to do the job right and have passed the necessary exams and criteria for acceptance into the Guild and are bound by the Guild code of ethics. Your piano will sound and perform at its very best. Acoustic pianos are constructed of mostly timber. The biggest component of timber in the piano being the all-important soundboard which is supported behind the steel plate or frame. The soundboard supports the downward pressure of the strings and oscillates in sympathy with them. This action transduces the sound of the vibrating strings so that they can be clearly heard. The soundboard being such a big piece of timber moves with changes of humidity along with the bridges and tuning plank. These tiny movements caused by humidity, temperature, vibration and the natural tendency of stored energy (tension) in the string to gradually relax causes the piano pitch to change and the piano to go out of tune. The complex array of levers from the key to the wippen to the jack to the hammer that strikes the string, can over time and use, need to be adjusted (regulation). Poor regulation effects the response and tone of the piano. For these reasons pianos need to be tuned at least every twelve months. Periodic regulation and regular tuning keeps your valued piano to it’s optimum sound and performance, keeps the instrument at it’s designed pitch A440 and helps maintain its value. The cost for this service each year is minimal compared to the cost of major repairs and overhauls, which can result from neglecting your piano. Many, many years of pleasure can be derived from a well- maintained piano. When choosing a piano there are many things to consider, such as upright or grand, what height or what length piano, what finish and colour, what brand and whether digital or acoustic to name a few. The Australian Piano Buyers Guide is an excellent read to gain some insight into deciding which instrument is right for you. Click Here or the icon on this site to receive your FREE copy. Buying your new piano from a qualified piano tuner can be a rewarding experience. Buying from a salesman may be fine, but a piano tuner/technician has knowledge and experience in the construction and maintenance of the inside of the piano and has an interest in your instrument long after your initial purchase. 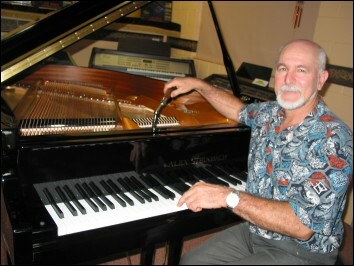 A piano tuner/supplier knows how to select the best quality instrument for performance, longevity and value. Your piano tuner is the one most likely to care for your instrument for years to come. Selling the best value instrument available makes perfect sense for the tuner/supplier and most importantly, you the customer. Piano tuners are generally passionate about their work and love to work with good pianos. Beware of cheaper instruments. It may turn out that performance and longevity are compromised. There is generally always a good reason for the cheap price tag. Old pianos can be thought of like old cars. Ongoing maintenance can be expensive and good performance may not be possible without major rebuilding. Most old pianos that are offered for sale generally haven’t been serviced or tuned in years and may have suffered major damage from neglect and the ravages of excess humidity throughout their lives. Excess humidity changes can cause soundboard, tuning plank and bridge problems that may not be immediately obvious to the untrained eye. If buying an old piano it is imperative that you seek the advice of a qualified piano tuner. Most tuners offer an appraisal service for a small fee. A written report from your piano tuner can take much of the guesswork out of purchasing an old clunker. As discussed previously humidity can have a profound effect on the performance of your piano. Short term, immediately obvious effects are stuck keys, notes that won’t sound, sluggish action, dull sound and tight fallboards. Long term effects can be warped and cracked timber components, swollen lead key weights, loss of tuning plank grip on tuning pins, hardening of felting, compromised glued joints to name a few. Pianos need a certain moisture content retained in the timber, usually around 8-10%. This would be maintained if the relative humidity in the air around the piano was at an ideal constant 42%. On the South East Queensland coastal areas we have found humidity levels to change from as high as over 90% to lower than 30% . The piano timber soaks in and gives up this moisture from the surrounding atmosphere slowly but follows these changing patterns throughout the year, sometimes causing these long and short term faults in the piano. It is best to position your piano in the central part of the home, on an inside wall. Away from heaters, fireplaces, and air conditioners and draughty movements of air through doorways and windows. If being stored for a period, off bare concrete floors and not stored in sheds and garages if possible. A PIANO LIFE SAVER SYSTEM by Dampp Chaser is a piece of equipment that can be fitted in to your piano to help alleviate humidity problems. It does this by creating a regulated, close to constant 42% relative humidity inside the piano. Under these conditions your piano performs and sounds its very best year in, year out and will last at least twice as long. Some pianos will react to changes in humidity worse than others. Even in the best of positions in a home, humidity can still sometimes be a problem. If in doubt, get your tuner to assess whether your piano needs this equipment. Personally I have found that pianos in good condition, fitted with these systems perform very well and are very stable with little or no problems after fitting. ELECTRONIC ORGAN/KEYBOARD SERVICING. Since the 1930’s electronic music keyboard systems have evolved in to awesome achievements in sound reproduction. The latest generation of microprocessor controlled memory based instruments have unsurpassed capabilities, functions, features and reliability. We have gone through around 80 years of research and development worldwide, to having available now instruments that allow musicians to be creative at all levels. Everybody can enjoy the thrill of playing music. Electronic organ and keyboard product servicing profession has never been totally easy. Although I admit some jobs are a breeze. But mostly the difficulty in fault finding is having to be familiar with the different systems of electronics used in different models even within the same manufacturer. The systems used in electronic keyboard instruments over the last 80 years have varied greatly. From magnetic tone wheel systems with valve amplification and filtering invented by Laurens Hammond in 1934 to discreet transistor, oscillation, filtering, and amplification, found later in Japanese instruments. Top octave synthesizer systems then became popular to keyer divider systems with digital control matrixes. Microprocessor controlled systems with pulse code modulation emerged giving us a taste of truer voicing with the advent of MIDI. Then came digital organs with the memory based systems we enjoy now. All these complicated systems had also many variances in between. Trained technicians conversant with all these types of electronic keyboard instruments are getting a little hard to find as the years roll on and technology changes. Our business takes pride in being able to offer this service to organ/keyboard owners. Not all piano tuners repair and service electronic organs. This is a highly specialized field, which requires dedicated training in electronics and electrical servicing. It takes years to acquire the expertise to service all makes and models of electronic contemporary and classic organs. It is now also a requirement by law, to be an electrical license holder to carry out repairs to organs, pianos and keyboards that are plugged into 240volt household power sockets. For your safety, if you are concerned, ask to see a license. The areas we cover with tuning and servicing are the Wide Bay/Burnett, Cooloola Coast, and top end of Sunshine Coast region . We also service these and outlying areas with new and used pianos, organs and keyboards. AN EXPLANATION OF INHARMONICITY. To understand the complexities of tuning a piano, one has to first understand the basic physics of a vibrating piece of music wire under tension between two support points. In other words the vibrating piano string when it is struck with the felt hammer. The energised string behaves in a peculiar and complex manner, moving basically in a 360 degree plane, wobbling if you like, from several specific points along its length. The string virtually wobbles in a bow the full length of the string. The sound produced by this energy is the fundamental harmonic and lets say it is moving or vibrating at 220 times a second, or A on the piano below mid C. The string also divides and vibrates from the centre of its length in two smaller bows about half the size of the fundamental. This energy in the string produces a frequency twice that of the fundamental ie. 440 times a second or A an octave up. This is not the end of it though. The string continues to divide in half, in each section with these sections producing mathematical multiples of the very first fundamental harmonic. The harmonics produced within the one vibrating string goes: fundamental, octave, octave and a perfect fifth, double octave, double octave and a major third, double octave and a perfect fifth, double octave and a dominant seventh, triple octave and on and on gradually getting weaker in energy or sound volume produced as the harmonics progress. The notes produced would in other words be: A,A,E,A,C#,E,G,A….. this is as you might agree a lot of sound or notes coming from one string. Quite so, and that is one reason why the piano sound is so appealing and hard to reproduce electronically. Around 20 harmonics in a good piano exist with only the first few that can be clearly heard and used in the tuning process. Once this concept is grasped, we have to take into account that the string has stiffness, thickness and weight. If it were a theoretically perfect string with no thickness, stiffness or weight, then the produced harmonics would be perfect mathematical multiples of the fundamental. But imagine the vibrating string again. Where it divides in half the first time, producing the second A ie. A440, because of the imperfect conditions of thickness, stiffness and weight of the string, there is a small section in the centre of the string (second harmonic) that virtually does not move. Thus the length of the vibrating sections producing the second harmonic are not quite equal to the length producing the fundamental or first harmonic. This means that instead of the second harmonic vibrating at 440 times a second it could be something like say for example, 439 times a second, making the second harmonic slightly flat i.e. one cycle per second, to the fundamental. This flatting of the harmonics occurs progressively all the way up the harmonic ladder and produces what is called – inharmonicity in the piano. All pianos are unique in their inharmonicity because of the differences in timber, stringing, scaling, bridge positions and many other factors effecting this phenomenon. Every piano has to be tuned basically according to its amount of inharmonicity. The octaves are gradually and slightly sharped from bass through tenor to treble, by varying amounts according to the individual instrument. Thus compensating for the out of tune harmonics with in each string. Phew! A little heavy going, but an important step in coming to grips with piano tuning techniques. When I learnt piano tuning, this concept wasn’t revealed for the first couple of years. Once it was explained, the jigsaw puzzle started to make some sense. Learning the relationship and interaction of coincident harmonics of one note with another is the next concept to grasp. A Day In The Life Of A Piano Tuner. The night before several calls were made to customers to organise the day’s work. This could be in any town in the Wide Bay/Burnett/ Cooloola Coast/ Sunshine Coast region. An early start is the go as the travelling usually takes between a half hour to a little over an hour to the first customer. Usually a rise at 5.30am gets to the first job around 7am. Some customers are a little bleary eyed at this time but most are up and preparing for work themselves. A quick greeting amongst the confusion of getting breakfast under way and organising the kids for school, the lady of the house leads to the piano and offers a cuppa. A coffee first up kick starts the grey matter and seems to help concentration . With kids scurrying to get ready, Dad throwing down breakfast and disciplining the slow coaches, Mum answering the phone the dog going berserk with all the excitement and the old grandfather clock on the wall tick tocking and chiming out of tune we begin this all important work on the piano. A clean throughout may be in order, a quick check to measure pitch and get the feel of the playability, touch or action of the piano. Adjustments need to done and any faults rectified before tuning. After establishing the pitch of the piano a decision is made whether to pitch raise (bring to standard A440) or to tune to the piano's present pitch. Some pianos are left far too long between tunings, pitch can drop drastically, making it difficult to bring to A440. All ok tuning begins. Once the temperament is set and all notes are in their correct equal tempered relationship, the unisons are once more checked for stability. By this time it’s around 9.30 am. Time maybe for another coffee and a chinwag. Next job, if the homework is done correctly, shouldn’t be too far away so a short drive to the next customer brings us to a piano we haven’t seen before. "Hasn’t been tuned for thirty years", we’re informed and the heart sinks a little as we know that this could spell trouble. Pianos can develop problems from neglect, age and humidity. As we take off the upper and lower boards, our trained eye is going over for tell tale signs of all kinds of nasties. Like sprung plates, weak tuning planks, split sound boards, cracked bridges, vermin damage to felting and woodwork, glue and felt humidity related damage, string breakage and numerous other discreet, insidious and nitty gritty problems. Assessments and recommendations are offered and with the instructions from the owner, “mate just do what you can” we begin to put years of experience into getting this old clunker into shape. All serious faults are rectified, like tight or seized up moving parts, excessively worn friction parts, and loose centres in the hammers, wippens and jacks. A pitch raise is always the order of the day with this type of job, so we decide how much we are going to raise this instrument in pitch. Sometimes it is just not advisable to raise any more than the highest pitch found, because of possible string breakage and the piano not structurally sound. Two hours or so later we are happy with the result so after we have a short discussion with the piano owner on how to look after this delicate old marvel of musical wonderment - off to lunch. Oh No! not Maca's again. First job for the afternoon is an appraisal on an old piano the customer has requested us to do for them. When buying a piano privately or without a guarantee it is always advisable to have a qualified and or experienced person in piano repair to assess the quality and condition of the piano before buying. It’s like buying a second hand car. It may look good from the outside but inside it could well be a nightmare. Upon arrival we greet the owners and they are happy for us to do the appraisal for our client. Cabinet checks first, then pedal traps and while we’re down the bottom of the piano we check for bridge/ soundboard and plate relationships. Looking for any irregularities and obvious and not so obvious splits and cracks in timberwork. Down bearing checks are done at this time also. All defects are noted down for the final report. Next the action of the piano is checked by playing each and every note. An experienced tuner can pick up quickly any problems with the playability even before the action is looked at or removed. The action is now viewed and we are looking for signs of wear and the stage of wear of the felting and friction points in the action. This is all noted down. We take out the action now and have a close look at and across all the working parts. While the action is out the tenor and treble bridges are checked along with all other normally obscured parts of the soundboard and plate. With all this assessed, the action goes back in, and another check of the action and pedals done. Pitch is then checked across the whole keyboard and tuning pin stability is checked. With all this information listed we can give our customer an indication of good, bad or in between condition of their impending purchase. Last job booked in for the day is a piano at one of the local schools. Signing in at the office we head to the music room. Usually with a bit of luck we manage to arrive at the school when the kids are heading for home. So all is quiet and peaceful. Listening to that all important interaction of piano string harmonics can get intense. The biggest distraction when comparing piano intervals is human voices in the background. Like tuning during a ladies morning tea gathering can be absolute murder. A fine tune generally is all that is needed here as we have tuned this piano regularly over the years and it was last tuned 12 months almost to the day. Happy with the days work and with the feeling of accomplishment we head home a little weary. You know, the piano is deeply embedded in our culture and is one of man’s finest and most clever inventions. In the hands of the piano player, this incredible instrument has entertained us for hundreds of generations since it emerged from Europe around three centuries ago. May the acoustic piano go on forever! !